CPVC resin-Chlorinated Polyethylene|CPE|Acrylic Processing Aid|AIP|Acrylic Impact Modifier|AIM|Impact Modifier|ADC blowing agent|Chlorinated Polyvinyl Chloride|CPVC|Polychloroprene Rubbe|Chloroprene Rubber|Neoprene |Chlorinated Rubber|Thermoplastic Polyurethane Resin|TPU)|High Chlorinated Polyethylene |HCPE|Chlorosulfonated Polyethylene|CSM-Acrylic Processing Aid, Chlorinated Polyethylene - Sundow Polymers Co.,Ltd. 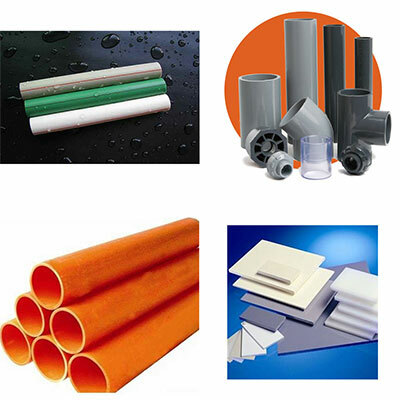 CPVC is a thermoplastic produced by chlorination of polyvinyl chloride (PVC) resin, which is significantly more flexible and can withstand higher temperature than PVC. It is a high heat and corrosion resistant material, and it has become an important engineering thermoplastic due to its relatively low cost, high heat distortion temperature, chemical resistance, outstanding mechanical, and dielectric, flame and smoke resistance properties. CPVC was first commercialized by Noveon in the early 1960s and has since proven its value in a variety of industrial applications in which a high use temperature and excellent resistance to chemical are desirable. Uses include hot and cold water delivery pipes and industrial liquid handling. Besides pipe and fittings, many other industrial fluid-handling product are available in CPVC including pumps, valves , strainers, tower packing, and duct, as well as sheet for fabrication into tanks ,duct, and tank lining. Extrude of all kinds of heat-resistant plastic products where the highest vicat softening temperature is required.